According to figures from the German Organ Transplantation Foundation, the number of organ donors in Germany reached its lowest-ever level of 797 last year. At the end of August, more than 10,000 people in Germany were waiting for a donor organ. EKHA chairman Prof Raymond Vanholder said the Alliance would be pleased to see Germany would make this move as it would greatly boost the country’s transplant activity, the current low level of which is a matter of concern for all health stakeholders who are working for more sustainable health care, including EKHA. However, there is also a need for other action to put the change into practice, such as education of the general public, patients and the medical community of their role in organ donation and transplantation. 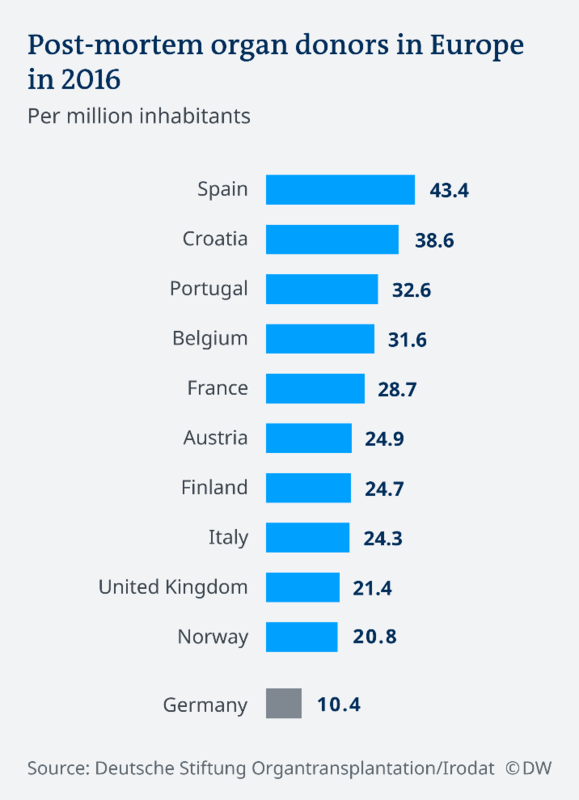 Spain, which has an opt-out system, is the EU country with the highest per capita rate of donors, with 43.4 donors per million inhabitants in 2016. Germany has one of the lowest rates, at 10.4 donors per million inhabitants in 2016. – appropriate legal, structural and cultural frameworks in EU member states to boost donation rates and hence reduce the numbers of deaths resulting from kidney failure while waiting for a transplant.